Spent most of the day in San Diego County, starting at La Jolla, then up San Eligo Lagoon, over to Scripps Ranch, down to the San Diego River flood control channel, east to Pine Valley, on to Jacumba, and ending up just before dark at Fig Lagoon in Imperial County. At San Elijo were the usual California Gnatcatchers, which I added to my “year list” of photographed birds. (Up to 362 so far this year.) 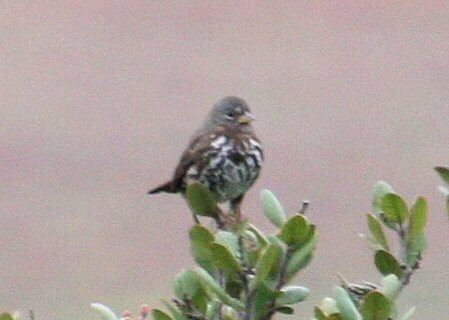 Perhaps the most noteworthy bird was a Fox Sparrow perched up on a bush. Pine Valley had a nice mix of mountain birds, but even better, between Pine Valley and the Golden Acorn Casino, maybe 5 miles west of Boulevard, a pair of Pinyon Jays flew across the road in front of my SUV. 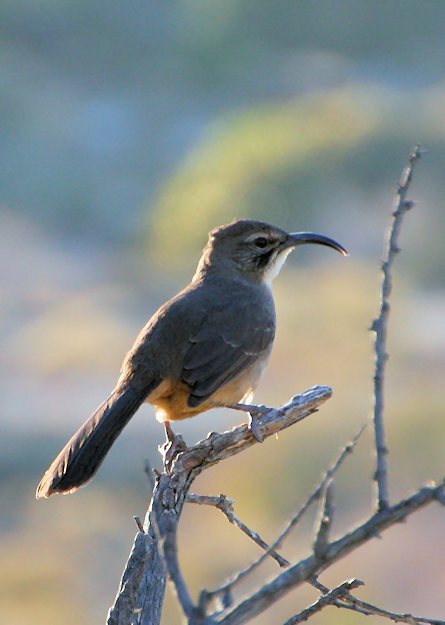 While in Jacumba I scanned for the California Thrasher I “always” find on the west side of town. Nothing. So I played a snippet of his song on my iPod. Still nothing. So I looked behind me and there was a big California Thrasher running accross the path not ten feet behind me. Another classic moment in birding!